Video: Elise Tries "Elise Tries" everything from animal cafes to K-Pop dance classes in this fun, funny travelogue featuring NPR's Seoul-based foreign correspondent, Elise Hu. July 12, 2017  In NPR's Elise Tries series, correspondent Elise Hu tries out different experiences in East Asia. In rapidly aging Japan, an edible innovation is helping seniors enjoy meals without fear of choking. July 3, 2017  In NPR's Elise Tries series, correspondent Elise Hu tries out new experiences in East Asia. In Tokyo, she checks out Japanese purikura photo booths, which produce selfies to decorate and print out. June 26, 2017  In NPR's Elise Tries series, correspondent Elise Hu tries out new experiences in East Asia. In this episode from Seoul, K-pop dance steps prove too complicated for completion. June 16, 2017  In NPR's Elise Tries series, correspondent Elise Hu tries out new experiences in East Asia. In this episode, Japanese toilets: so automated and comfortable, you might never want to leave the bathroom. June 13, 2017  In NPR's Elise Tries series, correspondent Elise Hu tests out new experiences in East Asia. 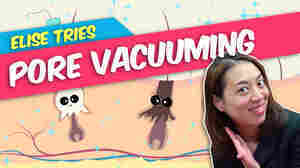 In this episode: pore vacuuming, a hot trend in Korean beauty. A suction pen excavates grime from your face. Video: Animal Cafes Are Cool, But Does A Raccoon Cafe Go Too Far? June 2, 2017  In NPR's Elise Tries series, correspondent Elise Hu tests out new experiences in East Asia. 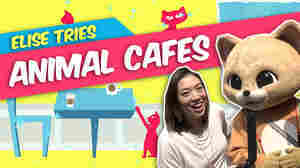 In this inaugural episode, she visits a South Korean animal cafe. Things don't go as smoothly as planned.